To confront climate change, we need to democratize, decarbonize, and decommodify our energy resources. At this past February’s “Alternative Models of Ownership Conference” hosted by the Labour Party in London, party leader Jeremy Corbyn asserted the centrality of energy policy to his vision of socialism: “The challenge of climate change requires us to radically shift the way we organize our economy.” He outlined a radical vision of an energy system powered by wind and solar, organized as a decentralized grid, democratically controlled by the communities that rely on it, and — crucially — publicly owned. Corbyn’s declaration laid out an exciting and ambitious vision of how socialists can press on climate change. But it also served as a reminder that socialists need to get serious about the politics of energy — lest disaster capitalism continue to shape energy policy. We must get involved in concrete campaigns to transform how energy is governed and push for a just transition to renewable sources. The terrain of energy politics is multifaceted, comprising the production, transformation, distribution, and consumption of energy. Energy sources such as coal, oil, natural gas, biomass, hydropower, sunlight, and wind each entail distinct social and environmental costs related to their extraction or capture, and their subsequent transformation into usable electricity. Electrical grids connect energy production and transformation to its sites of consumption. Grids encompass both the high-voltage transmission of electricity from where it’s generated to population centers, and the direct distribution of that electricity to homes and businesses. In the US, beginning in the early 1990s, energy deregulation encouraged a separation in ownership between energy generation and its distribution, resulting in an increasingly complex set of state-level markets of competing energy providers, which in turn sell energy to the private, public, or cooperatively owned utilities. In this terrain, there are several points of entry for eco-socialist politics. Broadly, our energy vision should center on the three D’s: decarbonize, democratize, and decommodify. Decarbonizing energy sources requires massive political confrontation with the fossil-fuel industry — a movement currently being led by the frontline communities most impacted by fossil-fuel extraction and its transformation — combined with federal and state-level policies that punish carbon emissions and a regulatory framework that encourages transition to renewable sources. Meanwhile, democratization and decommodification — the collective control of energy distribution that treats energy access as a human right rather than an opportunity for profit — are another point of entry. To achieve these ends, socialists must politicize the grid, and propose alternative visions of ownership and decision-making. In the United States, over two-thirds of electricity users are served by for-profit utilities. These private monopolies are often overseen by state-level energy commissions that are ripe for regulatory capture by Big Energy and the fossil-fuel industry. Even where utilities are publicly owned, technocratic governance structures provide limited fora for public input, let alone real democratic control. Building a bridge toward a socialist energy future requires a vision of a system that removes the profit motive from the delivery of utilities services and establishes energy as a universal human right alongside other basic human needs. Ultimately, the three D’s of an eco-socialist energy vision are interconnected. If a transition away from fossil-fuel energy sources is absolutely necessary for human and planetary survival, the capitalist status quo of private, for-profit utilities is an obstacle to a sustainable future. Unlike coal, oil, and natural gas, solar and wind power are seasonally variable and unevenly distributed. Collective, democratic control of the energy grid is vital not only to put an end to fuel poverty and ensure that everyone’s basic needs are met, but to reliably combine and redistribute renewable energy sources. Our choices are eco-socialism or barbarism. Achieving such a transformative vision requires concrete campaigns that challenge energy and fossil-fuel corporations, and disrupt the circuits of political and economic power that prioritize profit over the needs of humans and the planet. Such campaigns must be led by working-class movements demanding the satisfaction of basic needs and the transition to an ecologically sustainable grid — a vision that is increasingly possible, given the rapidly falling prices of renewables. In Rhode Island, the Providence chapter of the Democratic Socialists of America (DSA), in close alliance with the George Wiley Center, is taking on the National Grid, a private multinational utilities company which is currently awash in billions of dollars in annual profits and consumer-fronted infrastructure projects. National Grid formed as a result of Thatcher-era utilities privatization in the UK. It has since has become a major player in the northeastern United States, operating electricity transmission and delivering electricity and natural gas through several subsidiary companies in Massachusetts, Rhode Island, and New York. Our campaign, #NationalizeGrid, ultimately envisions a statewide, publicly owned, decentralized, and democratically controlled utility. Our first priority, however, is to address the shutoff crisis — the termination of gas and electricity service due to inability to pay the bill — that affects tens of thousands of poor and working-class Rhode Islanders every year. This crisis is only likely to worsen, as National Grid is proposing another rate increase — the third in the last year alone. In this context, Providence DSA and the George Wiley Center are gearing up for a fight to ensure affordable heat and electricity for all. More than 90 percent of Rhode Islanders are served by National Grid, giving it the appearance of a monopoly. The only thing holding back its immense greed, albeit in a limited capacity, is the state’s Public Utility Commission (PUC). Three unaccountable and appointed commissioners serve on this “quasi-judicial tribunal” that sets the terms of debate around utility “rates, tariffs, tolls, and charges,” as well as approves or rejects proposed rate increases and infrastructure projects. It sounds innocuous enough. But far from serving the titular “public”, the PUC functions to ensure National Grid’s profits, rubber-stamping their proposed rate hikes and pet projects. Witness the summer of 2017, the last time National Grid successfully raised rates on Rhode Island customers. In Rhode Island, National Grid’s rates are decoupled. This means that customers are charged separately for the cost of generated energy, which National Grid purchases from generators and passes on to customers at cost, and the cost of distributing that energy, from which National Grid is able to run a profit. In July 2017, National Grid told the PUC that they had purchased generated energy at a price that was 53 percent higher than their last purchase due to a regional spike in the cost of natural gas. This was compounded by the failure of energy-generation companies in the region to replace old power plants that came offline, resulting in an energy shortage. This poor planning and resulting price increase led to a sharp spike of 20 percent on the average bill. As one can imagine, this caused an uproar from both the public and elected officials. But while the PUC hemmed and hawed at how irresponsible and incompetent National Grid had been, their rate hike was approved. In November 2017, National Grid announced that they planned to raise rates again. This time, it was an increase in the base distribution rate, the part of the bill from which National Grid is allowed to profit. The proposed increase was intended to raise revenue by over $70 million per year, but was later revised down due to savings from the Trump tax scam. But besides this rate increase, National Grid has also proposed hundreds of millions of dollars in proposed “cost recovery” for a variety of infrastructure projects. National Grid is allowed to pass on the cost of their projects directly to the customers but with little to no input from the community in the planning of these projects. Public investment thus fuels the most profitable part of their business. Instead of projects that meet the people’s basic needs, National Grid’s biggest proposal is a complete overhaul of the state’s utility meters. Out go the old dials and in come already out-of-date “smart meters” which will send data via radio waves and require a technician to drive past the meters in order to collect said data instead of sending the information to a central hub. These meters will let National Grid turn off a customer’s gas and electricity at the flip of a switch rather than sending a crew to a home, reducing labor costs and disciplining poor people in one swoop. National Grid is also proposing investments in electric-car charging stations, currently a form of affluent green consumerism that is not relevant to most Rhode Islanders. But perhaps the most concerning of this set of projects is the proposed overhaul of the company’s US gas-heating business, including a large software and IT overhaul. National Grid’s business is wildly out of date (much of the business still relies on paper records) but the problem is that we cannot trust them to do this update in an effective or efficient manner. The last time National Grid attempted a project of this type, they did such a poor job that the project ended up costing triple what was expected, from $383 million to $945 million. To top it off, a dangerous Liquified Natural Gas (LNG) facility is coming to South Providence. LNG plants, which liquefy natural gas to enable transport to distant markets, are a key element of an emerging transnational energy economy linking fracked shale gas to European consumers. Further, following a common pattern of project siting, the facility is a blatant example of environmental racism and is moving forward despite overwhelming opposition from area residents and organizations, including No LNG in PVD and the FANG Collective. Local energy policy is a node of the dynamics of global capitalism — and thus a potential site for organizing that disrupts the circuits of the fossil economy. But this policy-making arena is protected by political barriers to entry. One major barrier to organizing around utilities justice is the intentional complexity of the issue. After starting the #NationalizeGrid campaign, the first thing we had to do was get informed. That meant wading through the Docket 4770 filing — a staggering maze of legal jargon spanning over 6,000 pages wherein National Grid lays out its case for a rate increase and infrastructure investments. Thanks to the hard work of many dedicated members, we were able to get a grasp of the issues at hand. But our experience showed us just how inaccessible these issues are for the average person. In Rhode Island, the George Wiley Center has been an essential force in the fight for utilities justice for decades. A grassroots agency committed to organizing with low-income residents to fight the systems that generate and sustain poverty, the George Wiley Center was instrumental in the passage of the Henry Shelton Act in 2011, which allows financially stressed National Grid customers to be forgiven a percentage of their unpaid utility bills. In recent years, they have successfully organized with impacted residents each fall by lobbying the PUC to ensure utility-service restoration before the cold winter months for the thousands of low-income Rhode Islanders who have their electric and gas shut off each year. From the time PIPP was implemented in 1986 until it was eliminated in Rhode Island and many other states during a wave of neoliberal deregulation in the 1990s, this program provided financial relief for thousands of low-income Rhode Islanders and many more throughout the US. While it remains a successful program for low-income residents in over a dozen states nationwide, National Grid continues to resist efforts to reinstate PIPP in Rhode Island. As Providence DSA began developing our campaign to take on National Grid and achieve utilities justice, it was an obvious decision to align our efforts in coalition with the George Wiley Center and their deep roots in community organizing here in Rhode Island. So, we immediately got to work in fall and winter 2017 with writing petitions to the PUC to fight the shutoffs, joining their effort to reinstate PIPP, and engaging in militant and disruptive lobbying tactics at the PUC against National Grid’s utility-rate hikes. Normally these PUC hearings are sleepy affairs, but a combination of Providence DSA, the George Wiley Center, and other local leftist groups have livened them up. At recent hearings in Pawtucket and Providence, the PUC members have been told some hard truths about their role in a process which shuts out those most affected by the decisions of PUC and National Grid. We have made a concerted effort to force the PUC to shift its focus from National Grid and its financial desires to the impact that high utility bills have on marginalized and oppressed peoples, especially the poor, the elderly, those on fixed income, people with disabilities, and those with chronic or severe health problems. 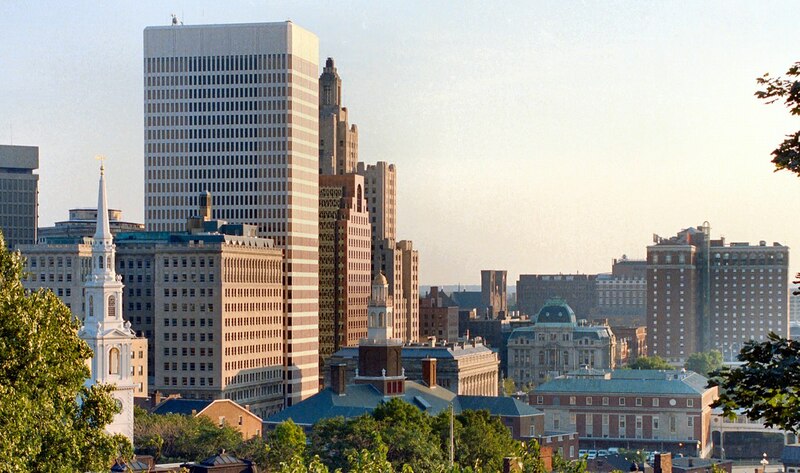 The George Wiley Center and Providence DSA have been able to achieve some short-term wins and developed momentum and enthusiasm around particular reforms through widespread public engagement, but it remains a constant struggle to carve out the most basic of human rights from National Grid and the PUC. The structural deficits of the for-profit model are ample evidence that if we want to achieve our goals, we are first going to have to articulate a vision of a better, more accountable, and democratically controlled grid. In order to organize ourselves for the political fight we’re confronting and prompt us toward bold and strategic action, it is important that we develop a vigorous and encompassing vision of what the future of public utilities and energy might look like. To help in that effort, we can draw from other examples of democratization, decarbonization, and decommodification, both in the United States and abroad. There is a long history of public utilities here in the US, going all the way back to the Tennessee Valley Authority (TVA). Instituted in 1933, the TVA is a federally owned corporation that was developed as an outgrowth of the New Deal. While there is much to be said for the TVA in terms of modernization, affordability, and public ownership, it is not democratically owned or operated and has recently come under fire for its slowness to adopt solar-power solutions compared to its private peers. Today, the United States has over 2,000 community-owned electric companies serviced by the American Public Power Association, as well as 900 electric cooperatives represented by the National Rural Electric Cooperative Association. Still, private corporations — usually overseen by unaccountable state public utilities commissions — provide the majority of utilities in this country. While it is possible to imagine a future in which a US public energy grid is nationally owned and managed by the public, it is useful to consider our current goals within the context and constraints of the state laws that now govern the ownership and administration of utilities. Nebraska is the only state in the US with an entirely publicly owned energy grid. The Nebraska model is made up of a network of 121 publicly owned utilities, 10 cooperatives, and 30 public power districts, which provide a platform for democratic participation and public accountability through publicly elected councils, power district boards, and cooperative boards. In recent years, public interest in renewables has helped push Nebraska’s publicly owned energy corporation to double its power generation from wind energy every year since 2006, though only 17 percent of Nebraska’s energy was produced by renewables in 2015. Looking abroad, nationalization of the energy sector from private interests is one of the main pillars of the Corbyn Labour Party’s plan to democratize the economy in Britain through “Alternative Models of Ownership.” Under this model, the state would own the energy grid itself, while municipal utilities providers would be responsible for the democratic administration and delivery of services. While decentralization is essential from the perspective of democratization of the grid, it is also a critical aspect of decarbonization. To see the success of localized efforts to transition to sustainability, we need only look to the over 100 cities now receiving 70 percent or more of their electricity through renewables. Through the Labour Party’s energy plan, Corbyn and the Momentum slate claim that their model of publicly owned utilities will be able to outcompete the private and carbon-based National Grid by offering cheaper, more efficient, and higher quality service than its private counterpart. Providence DSA and other DSA chapters whose membership is under the service of National Grid here in the US have an opportunity to develop a regional strategy and messaging platform that aligns with the Labour Party’s plans to take on National Grid, while also developing an on-the-ground approach that is responsive to the specific needs and organizational strengths of the communities where we live. Domestically, there are a number of cities that have moved aggressively to renewables–from Boulder, CO to Burlington, VT–but an example of particular interest for our vision is the city of Los Angeles. Owned by the city and responsive to the needs of elected officials and utilities customers, the LA Department of Water and Power (LADWP) determines the sourcing and administers the delivery of power in the city. Los Angeles is currently on track to meet the goal of running 33 percent of the city on renewables by 2020, thanks in no small part to structures of access that provide a platform for the public to hold the LADWP to account. There remain a number of potential problems with utilities municipalization and cooperatization, though, both in terms of decarbonization and decommodification. The majority of existing models center around rural communities, for example, and most cooperatives still depend on–and often advocate in favor of–coal and other carbon-based energy solutions. Furthermore, some models of utilities municipalization may tend to favor middle- and upper-class communities with time, money, and influence to organize and advocate for themselves, potentially leaving low-income communities under the control of private utility companies. For a model of public utilities municipalization like this to be equitable, sustainable, and available to all, measures will be required to ensure that low-income municipalities have the resources needed to achieve full agency and determine their shared energy future. Providence DSA and our eco-socialist vision are uniquely positioned to help facilitate this transition by encouraging a broad convergence of people and interests. Whether someone is concerned about choosing between eating and paying their utility bill, worried about the impending sea level rise in the East Bay of Rhode Island, or upset about the impending development of an LNG pipeline through a neighborhood occupied primarily by low-income people of color, our radical vision of a different kind of energy grid and and utilities system offers us both a common enemy and a shared vision of a positive alternative. As we continue developing our plan to #NationalizeGrid here in Rhode Island, throughout the country, and beyond, we must balance the three pillars of democratization, decarbonization, and decommodification with one another to ensure that each is structurally supported by, and complementary to, the other. This means no public takeover without an understanding of utilities as a basic human right that requires a full transition to renewables. It means understanding that affordability may only be achieved once we have transitioned to a sustainable grid that is democratically owned and managed by the public. And it means the transition to renewables will only satisfy our requirements if that transition is both public and affordable for everyone. Thea Riofrancos is an assistant professor of political science at Providence College. Robert Shaw is a writer, activist, and former social media coordinator for Providence DSA. Will Speck is a student of History and Black Studies at Rhode Island College and co-chair of the Providence chapter of the Democratic Socialists of America.